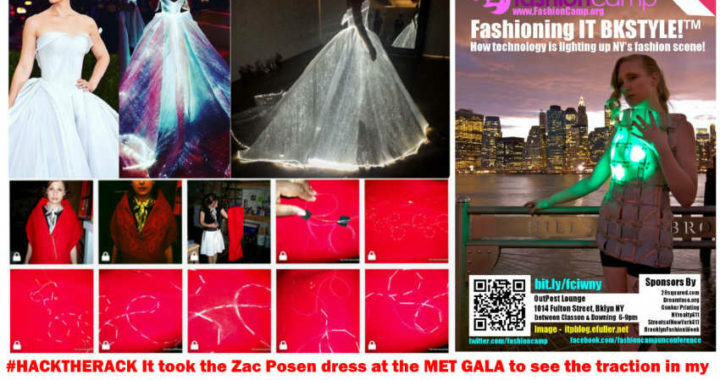 What is The fashion Tech behind Zac Posen’s Met gala illuminating dress! This post seems to be older than 2 years—a long time on the internet. Dated info and offers may no longer apply. Some technical info might be outdated. Please feel free to post a comment with any updated info . Inspired by calls for “How do I achieve this look!” I’ve added this Lighted dress to the list of hacks to tackle. The plan is to launch sometime June After NYukco’s CopulateNYC event. A viral reaction to the Zac Posen gown at this year;s met gala brought this to my attention. Sadly, in response, some simply did a search found a quote on the fabric Luminous fabric and fiber optic fabric “. In short unless the designer published the details one would have to look close up to get the real 411. I am sure however that some type of soft circuitry is involved especially in hemlines and seems. It’s also possible that the designer used some type of newly engineered fabric. What makes the fabric lightcould either be woven into the fabric or stitched over it like “embroidery”. In this the first layer looks opaque, not sheer as in the lumigram – the quality also appears much better. Featured Image credits – top clockwise screenshots of the Zac Posen dress. From a social media week we hosted in 2010 – Elizabeth Fuller’s Lifedress’- Dragon skin, LED and Copper. Finally, my 2010 collaboration with Catarina Mota (of Open Material) on this scarf lighted from within. Creating a space to explore suggested hacks.